HIGH ATMOSPHERE: Space weather enthusiasts will enjoy a new web site composed by atmospheric optics expert Les Cowley: "High Atmosphere" explains the physics and fascination of airglow, rocket trails, gravity waves and much more. Enjoy! Photo details: Canon 30D, Sigma 30mm lens, 1600 ISO, 2 sec. One of the many curiosities of Comet Holmes is the lack of a normal comet's tail. Since it exploded on Oct. 24th, Holmes has been almost perfectly spherical, more like a planet than a comet. Now, however, a tail may be emerging. "On Oct. 28th, I decided to take many short exposures to try to detect any hint of an ion tail," says Sean Walker of Chester New Hampshire. "Success! Note the faint, diffuse tail trailing off to the upper-left in this image:"
The emerging tail is even more distinct in a photo taken Oct. 29th by Pete Lawrence of Selsey, UK. "This is a 45 minute exposure (9x5 minute exposures) through my Vixen 4-inch refracting telescope," he explains. "The tail is extremely faint but is there heading off to the upper right of the coma. 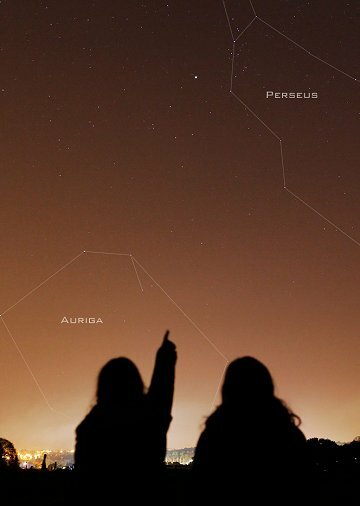 As the Moon moves out of the way, astrophotographers will have a better opportunity to focus on the faint structures that constitute that most important piece of a comet - its tail!" 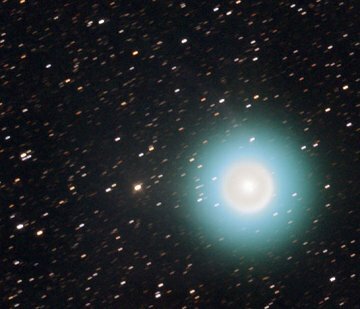 Readers, this comet is as bright as the stars of the Big Dipper, which makes it an easy target for backyard telescopes and off-the-shelf digital cameras. Point, click, and submit your images to Spaceweather.com! On October 30, 2007 there were 894 potentially hazardous asteroids.